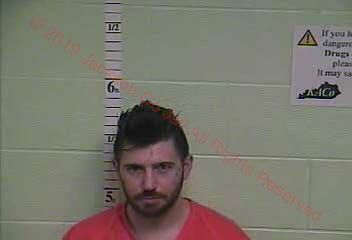 Logan Carpenter, 28, of McKee, KY appeared in court for a preliminary hearing and stipulated to ceratin charges. The case was sent to the grand jury. Logan Carpenter, 28, of McKee, KY was in District Court this Monday, April 08th, 2019 for a preliminary hearing before Judge Allen B. Roberts. Carpenter was arrested on March 31st, 2019 by KSP Trooper Nick Brumback. According to the uniform citation, Trooper Brumback received an anonymous tip that Carpenter was selling large amounts of methamphetamine and heroin. The tip also indicated that he was keeping the drugs on his person as he traveled around in a new GMC Denali truck. Trooper Brumback reported that he was in his vehicle sitting stationary at Pine Flat Laurel Creek Road and the junction of KY 2003 when he was advised by an undercover unit that the truck in question was heading his direction at a high rate of speed. Trooper Brumback angled his cruiser in the direction of the oncoming truck and recorded the truck traveling at 64 mph in a 55 mph with stationary radar on a very curvy road. Once Trooper Brumback fell behind the vehicle it slowed to 55 mph but the vehicle crossed the double center line with its left tires three times in a short stretch of roadway. Brumback conducted a traffic stop on the vehicle and made contact with the driver who identified himself as Logan Carpenter. There was also a female passenger in the vehicle who gave Trooper Brumback a false name but was later discovered to be Kyra King, 19, of McKee, KY. Carpenter was asked for proof of insurance but he was unable to provide it saying the truck belonged to a friend and he was just going to the gas station. Carpenter was asked if he had anything illegal in the car and he responded that he did not. Carpenter was told that law enforcement had received a tip regarding him selling drugs and he denied the allegation. Trooper Brumback requested permission to search the truck but Carpenter denied the request. At that time the Jackson County Sheriff’s Office K9 Unit was on scene and Trooper Brumback informed K9 Officer Daniel Isaacs that there was reasonable suspicion due to the tip that there may be drugs in the vehicle and/or on the person of the driver. Officer Isaacs spoke with the driver and advised him that K9 Gina would be doing an exterior sniff of the vehicle. K-9 Gina alerted on the vehicle giving probable cause to search the vehicle. During the search a black zip up container was discovered inside the driver side door panel that contained a spoon with methamphetamine along with multiple syringes. Two scales with methamphetamine residue were located in the center console of the truck along with multiple zip lock bags. Officer Isaacs also located a loaded syringe with schedule 2 pills with the female passenger’s (Kyra King) belongings. Trooper Brumback advised Carpenter he was under arrest and then conducted a search of his person. The search revealed a large amount of cash in his front pocket and multiple plastic bags. Trooper Brumback also reported that he believed he felt a plastic bag in Carpenter’s crotch area but Carpenter stated that was just his boxer shorts. He was advised that if he were hiding something there it would be found at the jail upon further search. Carpenter was handcuffed and placed in the back passenger side of the cruiser. Carpenter was advised that the car seat had been cleaned out earlier that day and not to put anything in the car. Carpenter again stated that he had nothing on him. The truck was towed and Carpenter was transported to the Jackson County Detention Center. While being escorted into the jail Carpenter dropped a white piece of paper on the ground which, upon inspection, appeared to be a ledger of who owed money and how much. When Trooper Brumback returned to his cruiser and searched the back seat where Carpenter had been sitting he found a zip lock bag stuffed behind the seat where Carpenter’s hands had been cuffed. Inside the zip lock bag were the following items: multiple bags of suspected methamphetamine totaling 1.22 ounces, one bag of suspected heroin, 4 hydrocodone 10 mg pills, 10-800 mg gabapentin pills, 3-400 mg gabapentin pills, and 4 suboxone pills. Trooper Brumback returned to the jail and informed Carpenter that he had found the drugs placed in the cruiser and Carpenter stated that he wished to remain silent. Carpenter was charged with speeding, failure to produce insurance card, no/expired KY registration receipt, trafficking in a controlled substance, 1st offense (>= 2 grams methamphetamine), trafficking in controlled substance, 1st offense (heroin), trafficking in controlled substance, 2nd degree, 1st offense (<20 D.U. Drug Unspecified Schedule 3), trafficking in controlled substance, 3rd degree, 1st offense, (<20 D.U. Drug Unspecified), drug paraphernalia – buy/possess, and tampering with physical evidence. In court on Monday, Carpenter stipulated to probable cause on charges 4 (methamphetamine), 6 (<20 D.U. of Schedule 3 drugs), & 9 (tampering with physical evidence). The cause was then held over to the grand jury for consideration. Carpenter was ordered to appear in Circuit Court on June 04th, 2019 to answer any indictment coming from the grand jury. The misdemeanors were sent along with the felony charges for grand jury consideration. Carpenter remains in custody at the Jackson County Detention Center under a $25,000 cash bond while awaiting his next court appearance.